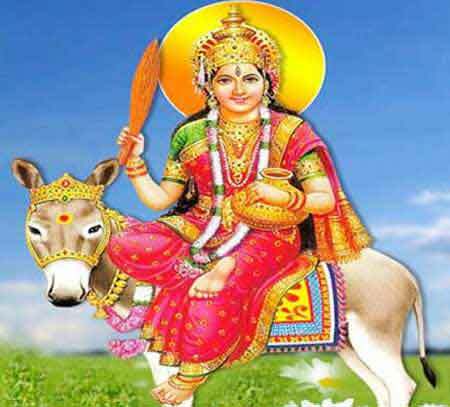 Shitala Satam is dedicated to Goddess Shitala Mata and is observed for the welfare of young children. Shitala Satam 2019 date is August 23 in Gujarat (Shravan Vad 7). Some Gujaratis observe it during Shravan Sud 7 and this is on August 17. You can als read the Shitala satam story below in detail. Mothers perform special pujas and offer prayers to Shitla Mata. The ritual is dedicated to Goddess Shitala, the goddess of pox and measles. It is observed for the welfare of children and others and to escape from measles and smallpox. There is a popular belief that with the blessings of Goddess Shitala, children and other will be protected from numerous contagious diseases like chickenpox etc. Shitala Satam is observed during two different times in Gujarat. In some parts of Gujarat especially that is near to Maharashtra, Shravan Shukla Paksha (Shravan Sud 6 - bright/waxing phase of moon) is preferred. In Saurashtra, Shravan Krishna Paksha (Shravan Vad 6 - dark/waning phase of moon) is preferred. Food cooked on previous day is eaten on the Shitala Satam day. The previous day is dedicated to cooking and is known as Randhan Chath. Laddos, thepla, sweet dhebra, paratha, various types of shaak, maunthar, bajra rotla, sabudana khichadi, mamra, vada, teeka dhebra, sheera and puri are prepared on the previous day. People also distribute food to poor people on Shitala Satam. Friends, relatives, and neighbors also share their food. The Shitala Satam Vrat katha is found in the Bhavishyottara Purana and is dedicated to the unwavering devotion of Princess Shubhakari. The princess was married to Prince Gunvan. The prince came back to get his wife after one year of marriage. But the day happened to be Shitala Satam day. Father of Princess Shubhakari had invited a priest and his wife to perform an important puja on the day. Therefore, Gunvan decided to wait for a couple of days. Princess Shubhakari went with her friends to a lake in the forest to perform puja to Shitala mata but they got lost. The princess got the correct direction from an elderly woman. Shubhakari then successfully completed her puja and rituals. Shitala Mata was happy with her and gave her darshan in the form of the elderly woman who showed her the way to the lake. Mata offered the princess a boon. Shubhakari told Shitala Mata that she would ask the boon at the appropriate time. When the princess returned to her kingdom, there was complete commotion. The main priest who was invited to perform Shitala Mata puja had died. This was a bad omen for the country. Shubhakari again went back to the lake and performed intense meditation. Mata appeared before her. As boon now, she asked for the life of the priest. Shitala Mata blessed the princess and told her that her wish will be fulfilled. The priest got back his life and the entire kingdom start praising Shitala Mata. From that day, people started performing Shitala Satam. Shubhakari then went along with Prince Gunvan to his kingdom. Here too she started performing puja for Shitala Mata. The kingdom prospered and people started performing Shitala Satam and puja of Goddess Shitala for finding cure to smallpox and other diseases. There is a popular belief that Goddess Shitala appears in homes and rolls on the cool ashes in the hearth or fireplace. The ashes used for extensive cooking on Randhan Chat are not removed and is kept for Goddess Shitala on Shitala Satam day.